I was able to persuade DH to extract 3 volunteer nandinas from the front flower bed (F2) for transplant in the back beds. I discovered that most of these offshoots seem to have sprouted from buried trunks and stems from the parent, since we required shears and clippers to sever them. Luckily these volunteers had small but developing root stock, so I am hoping they will thrive in their current locations (B1 and B5). I also have to mention that I removed the 1 surviving nandina in S1 for transplant into B5, where I hope it will enjoy more sun. In its place, I finally planted the new Azalea Gumpo White. I hope that its position next to the patio will give it sufficient protection against summer; I usually dump water into this part of the bed, especially when the dogs’ feeding bowls are set outdoors. I also had to get the purple salvia I purchased last week into the ground, after I discovered its mauled remains scattered in the backyard. Sadly, it met a deadly fate when Dash tore through the S1 bed a couple of days ago. I’m hoping it may have enough root stock left to make a comeback. Speaking of mauled plants, I also had to set one of the ajugas into S1 after I discovered the half-torn pot lying strewn in the bed. I suspect that strong winds or a rambunctious pup may have knocked it off its brick wall perch. 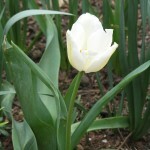 It seems to be blooming quietly and happily next to the replanted ring of tulips. B5 also required a little fixing; I discovered a crushed dianthus and uprooted lilies and muscari, which I had to reset into the ground. B5 is in serious need of ground raising and leveling; I hope to get some gardening soil into it next week. The soil will also be useful when I start broadcasting seed into the back beds. I have packets of cosmos, bachelor buttons, nigella, and a wildflower mix that are begging to be sown right now! I’ve begun using WP-Simpleviewer plugin to construct galleries for the garden pages. My intentions are for these galleries to capture the changing face of the flower beds from year to year. Here’s an old tulip making a comeback this year. 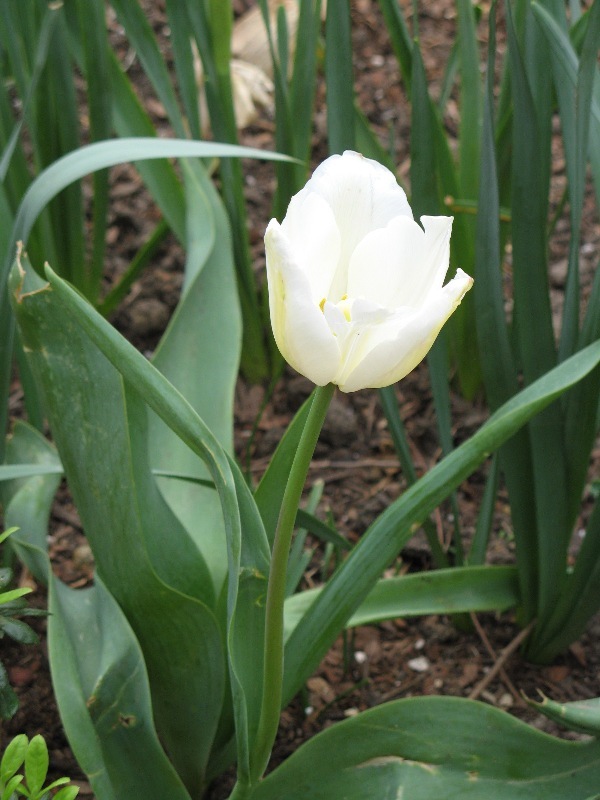 It came as a pleasant surprise to see several tulip patches coming up this year, and this one seems to be perfectly situated in my blue-and-white garden. Photo was taken mid-morning before a follow-up furry tornado whipped through the S1 bed and trampled some of the hapless daffodils. Sometimes being a dog owner and gardener makes for a disastrous combination. I stopped by Lowe’s and Cristina’s again for lunch today. At Lowe’s, I finally caved in and purchased a $2 quart of Azalea Gumpo White. Interestingly, the red azaleas are all in fierce bloom at the moment. I also spotted some Salvia greggii purples among the Hot Lips salvia; I picked up 1 pot of the purple. (I saw a curious microphylla-looking salvia labeled Crimson Sundae with rose-pink flowers also, but haven’t had much luck finding it on the net.) It was a long line at the Lowe’s checkout stand, but I managed to walk out with 2 plants and 2 bags each of the following: landscape soil, compost and red mulch. At Cristina’s, I picked up an 18 count flat of Dianthus mixed, making sure to collect some scarlets, reds, and whites this time. They did have a somewhat bigger selection of Salvia greggiis in 2″ pots, but whites were absent from the mix. Looking forward to planting this weekend. So, I get home yesterday evening and Dash greets me at the door. He’s happy-go-lucky, trembling-with-joy, all-sorts-of-enthusiastic fur-kid exuberance. Then I step into the backyard and beheld the carnage in S1. All my tulips were uprooted and a puppy-sized hole lay at the feet of my myrtle. And the Heuchera Obsidian? Obliterated from the face of the earth. I’m understandably upset…so I placed an irate call with the DH and reminded him how many times I requested that the rampaging-garden destroyers be crated while we’re away at work. The tulips are back in their settings…but the tulip show is done for this year. And maybe it’s for the best that the heuchera is gone…I worry that the exposed location would challenge any shade lover at the moment.